On a compact diagram, to hide or show some of the shapes is necessary. You can choose to hide away diagram elements on a diagram temporarily. For example, hiding away annotation shapes which record internal communications before printing out a diagram for customers' review. In Visual Paradigm, hiding of diagram elements can be done per shape, per shape type or by stereotype. Right click on the selected shape(s) and select Selection > Hide from the pop-up menu. Apart from the selected shapes, its related shape(s) (e.g. children and relationship) will also be hidden. NOTE: To hide a shape will also make the connectors that attached to it hidden. NOTE: To hide a container shape (e.g. package) will also make the contained shapes hidden. All the shapes with same type from the diagram can also be hidden. Right click on the diagram's background and select Diagram Content > Show/Hide > Hide by Shape Type, and then select the shape you want to be hidden from the pop-up menu. As a result, all shapes with the same type you selected will be hidden. 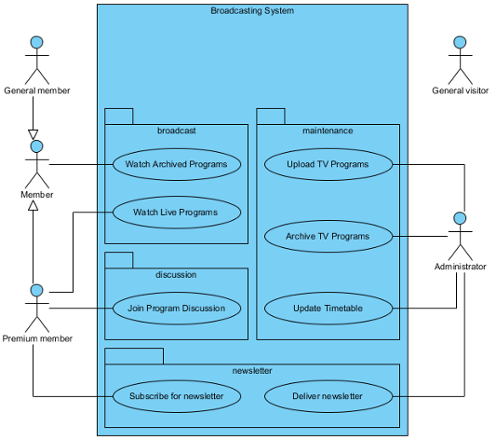 The stereotype of all diagram elements from the diagram can be hidden. 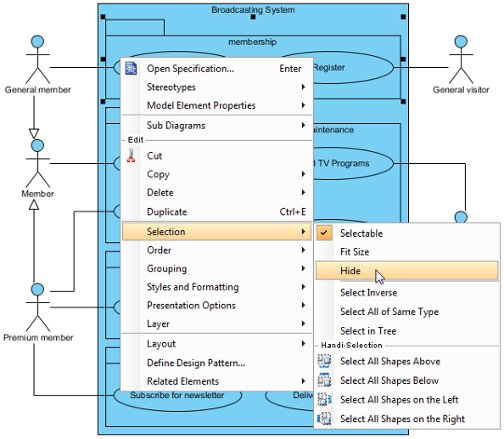 Right click on the diagram's background and select Diagram Content > Show/Hide > Hide by Stereotype, and then select one stereotype out of the list from the pop-up menu. As a result, all shapes with same stereotype you selected will be hidden. All hidden shapes from the diagram can be shown again. Right click on the diagram's background and select Diagram Content > Show/Hide > Show all Diagram Elements. As a result, the hidden shapes will be shown on the diagram. 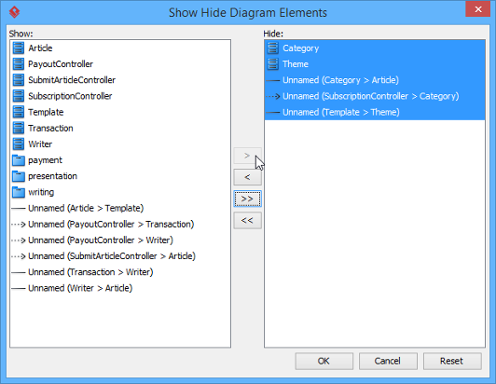 A better management of showing and hiding the shapes can be done in Show Hide Diagram Elements dialog box.. Right click on the diagram's background, select Diagram Content > Show/Hide > Show/Hide Diagram Elements... from the pop-up menu. When Show Hide Diagram Elements dialog box is unfolded, you may select the shape(s) you would like to be hidden or to be shown. Click the diagram element you would like to move to Hide list and press Hide Selected button; on the other hand, click the diagram element you would like to remove it back to Show list and press Show Selected button. For moving all diagram elements to Hide list, press Hide All button; press Show All button, vice verse. Finally, click OK to confirm. NOTE: If a shape is selected from Show list, the related shape(s) of the selected shape will be also removed to Hide list.